In 2014, you can look forward to reading many new books from Esri Press, and not just in paper- or hardback but in multiple digital formats, including ePUB; Kindle; and Esri's digital reader, the new Esri Bookstore app. With the Esri Bookstore app, you can engage in a new level of interactivity with select texts, watching a related video or viewing live maps and apps. Want more information on that map or how it was created? Simply click the web link from within the application and get instant access to the host website. Forthcoming books this year will cover Python, GIS technology updates, classic maps, and more—and all available digitally. E-books offer easier portability and access, so we invite you to try reading your favorite Esri Press reference, tutorial, or map book on the go. Learn how spatial analysis can help you better manage health services and support policy and decision making with GIS Tutorial for Health. 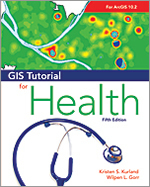 This long-standing workbook from Esri Press provides structured exercises so that health professionals and students can develop competencies in GIS. Readers will create, visualize, and assess issues ranging from cancer mortality rates to food-borne illness outbreaks. The fifth edition is compatible with ArcGIS 10.2 for Desktop and is available in print and as an e-book. Exercise data is available for download. Instructor resources are available separately. April 2014. 460 pp. Paperback (ISBN: 978-1-58948-372-9, US$79.99) and e-book (ISBN: 978-1-58948-373-6, US$59.99). 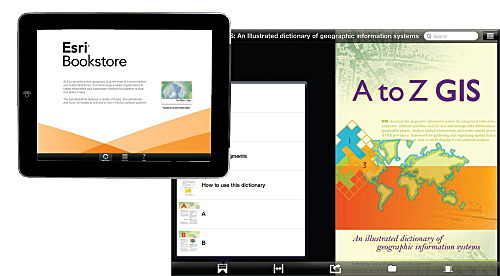 Esri Press e-books are available on the Esri Bookstore app or through online retailers. For information on all Esri Press publications, visit esri.com/esripress.